In lieu of a more cohesive post this week, here are a few random highlights that you might find interesting. A New YouTube Video by Eli Epstein: Eli Epstein is a big name in the horn world, both for his captivating playing as well as his insightful teaching. It was my pleasure to review his new book Horn Playing from the Inside Out, and I’m also very excited to share this new instructional video. Subtitled “Finger Breathing,” this nearly 20 minute lesson with Mr. Epstein ties together the major concepts from his book in one easily understood exercise. Although I have seen other pedagogues utilize the finger breath, I had not seen it used in this way before. In addition to demonstrating three different variations on the finger breath exercise, Mr. Epstein also performs several standard orchestral excerpts. It’s worth watching the video just to hear his playing! 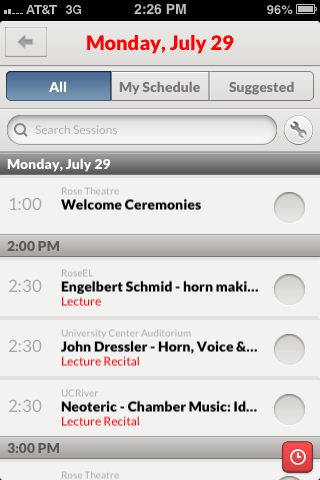 International Horn Symposium Mobile App: Ok, this probably doesn’t qualify as recent news, but the 45th International Horn Symposium is a little over a month away. In addition to the usual all-star lineup of performers, clinicians, and exhibitors, this year’s symposium may be the most technologically advanced one yet, thanks to symposium host and IHS webmaster Dr. Dan Phillips. The event website looks great – and, more importantly, is very functional – but on top of that the symposium boasts a free mobile app by Bloodhound. I haven’t explored all of the features yet, but at first glance it looks like it will be very useful in navigating the various venues and events at the symposium. The screenshot above shows the first couple of events on the first day. Hi, James! – I think I finally figured out what was wrong with me and WordPress commenting – we’ll see if this gets through. Thanks for the Eli Epstein video – I went ahead and got his book because of it – appreciate the tip.